Some people might think that a plant-based diet—what you might call “vegan”—is too extreme for children. But the truth is that pretty much every parent ever wants their kids to eat more vegetables. Conversations between new parents often veer into this potentially-contentious territory: Is your child a “good” eater? Picky? Mine loves broccoli! Mine eats blueberries and sweet potatoes, but won’t touch spinach. My kid only eats foods that are white and yellow!!! Mommy blogs are packed with ways—some ingenious, others downright sneaky—to get more produce into a child’s belly. Veggie pizzas! Use your spiralizer to make zucchini “pasta” instead of the normal kind! Let’s see how many fruits and veggies we can blend into this smoothie and still have it taste good! And a quick glimpse into any parenting forum or Facebook group will pull up all kinds of food-related questions. Is it normal that my kid doesn’t like cantaloupe? What are your favorite recipes or cookbooks to get more healthy food on the table? Help, I need a gluten-free, dairy-free, egg-free recipe for pumpkin pie or Thanksgiving is not going to happen!! 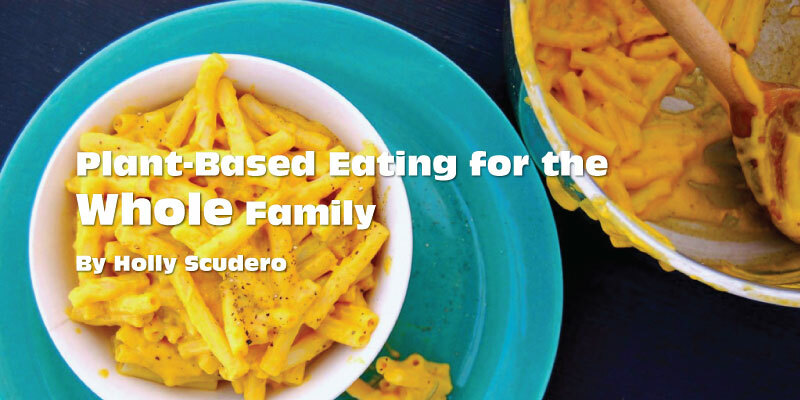 The truth is, that no matter how hard we try as parents, there will be days—sometimes weeks or months—where we feel like we’re failing at feeding our kids healthy food. We all want advice, and most of us spend time actively pursuing it. So whether or not you have any intention of going vegan full-time, who can argue with a cookbook filled with plant-based recipes designed specifically to appeal to children? 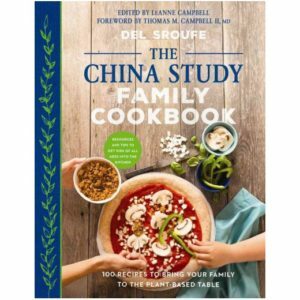 Del Sroufe’s The China Study Cookbook, inspired by T. Colin Campbell’s book about the infamous study on diet in rural China, is specifically intended to bring plant-based eating home to the average family dinner table. Vegan food is not extreme for anyone, and the recipes in here will prove just that. Some recipes are in-your-face about their healthy credentials, such as Potato, Cabbage, and White Bean Soup. Others are a little less obvious, like Sloppy Joes made with wheat berries, bell pepper, and celery and sweetened with, of all things, Date Puree. And some are definitely sneaky, like the seemingly-classic Mac and Cheese; who ever heard of making a “cheese” sauce out of potatoes, bell pepper, and cashews? Give this cookbook a try. You just might find yourself sneaking extra vegetables into your own diet while you’re at it! Prepare the macaroni according to the package instructions. Drain and transfer to a large mixing bowl. Add the cheese sauce and mix well. Pour the mixture into a nonstick 9×13-inch baking dish. Top with the bread crumbs, if desired. Bake until the bread crumbs re browned and the sauce is bubbly around the edges, 25 to 30 minutes. Alternately, you can heat the cheese sauce in a large saucepan and add the cooked macaroni; mix well and serve. Combine the potato, bell pepper, onion, and cashews in a small saucepan and cover with water. Bring the water to a boil over high heat; reduce the heat to medium and cook until the potatoes are very tender, about 10 minutes. Drain the vegetables, reserving ¾ cup of the cooking water. Combine the potato mixture, reserved cooking water, tahini, lemon juice, nutritional yeast, arrowroot powder, and sea salt in a blender. Process on high until everything is smooth and creamy, about 3 minutes. Use for Mac and Cheese, or store in an airtight container in the refrigerator for up to 5 days.